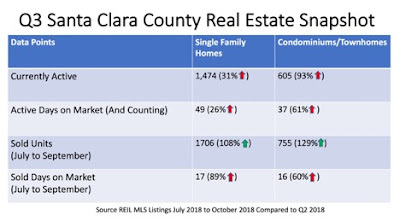 Q3 2018 has been yet another eventful quarter in our continuing shifting stabilizing Silicon Valley Real Estate Market. Please find our update to help guide your real estate decisions! Home prices peaked in the month of May and this market shift came very quickly. As mentioned in our Q2 update, the reasons were exhausted home bidders, unaffordability of prices, the drop in the NASDAQ Index in April, tax filing deadlines, coupled with a rise in inventory for the summer months. Homes started to sit on the market and Buyers took a wait and see approach which has continued until now and likely the rest of the year. The conundrum is that there are still Buyers out there, however affordability continue to be a concerning factor. 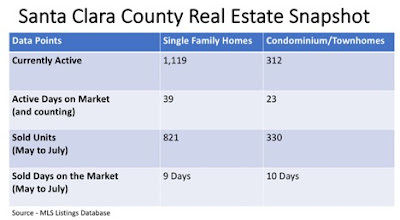 Taking Santa Clara County as a sample comparing to data from Q2 2018, the amount of Active homes increased in the Single Family Home category by 31% while Condominium/Townhomes increased by 93%. Subsequently the days on market also increased dramatically for Sold and Active homes in both categories. What is interesting is that Sold Units more than doubled the amount of units in Q2. This shows that Buyers demand is still there paired with more quantity of homes on the market during the summer months to purchase. In short, inventory and days on market are up, but Buyers are still purchasing homes but they are taking their time and looking for better pricing and more favorable terms. The crazy bidding market is gone and the Buyers in the market are at an advantage. On a Macro level there are many factors currently in-flux which are contributing to the stabilization of Real Estate such as the NASDAQ index, Trade Wars, Protectionism and Rising Interest Rates. The key concern is the health of the Stock Markets, especially the Technology-heavy NASDAQ index, which is the source of the majority of the down payments in the Silicon Valley. Notice the drop back in April and now another two recent drops in October. Oddly the economy and companies have generally been showing good overall health. There have been some companies that have revised lower guidance on earnings but most have shown decent earnings. Investor sentiment seem to be expressing concern across the board especially of a possibly overheated Technology sector and therefore companies being overvalued. We have just experienced the largest sell off in the second and third weeks of October and the markets have continued to show volatility since. The trade war with China is causing concerns about the impact to both economies. Companies who export from China are seeing their margins wiped out and goods from China could get more expensive here in the States. Companies that export to China will see a hit in revenue due to the counter tariffs from China. There is much concern from investors on the ultimate impact to profitability and this subsequently will affect equity values and our economy. The current protectionist policies are making the visa and residency process even more difficult than they have previously been. Many key believers in purchasing real estate in the Silicon Valley are typically from abroad. With this uncertainty, Buyers are holding off on their home purchases, heading home or heading to countries with simpler more transparent visa processes. Federal Reserve interest rates have been increased 3 times this year. This will ultimately impact affordability. Some Lenders have been able to keep interest rates around the 4.5% to 4.75% range. Some other lenders have touched the 5% mark. 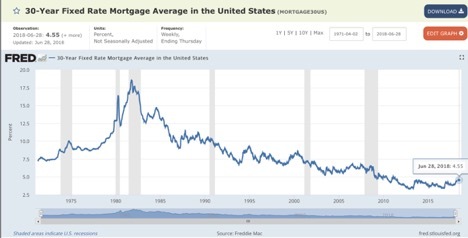 Despite concerns about affordability and rising rates, interest rates are still at historical lows. As we approach the holiday season, regardless of the overall market conditions, this tends to be the slower season for Real Estate overall. If you are a Buyer, this is your market to obtain deals due to the season and current market conditions. Lower down payments, under list price offers, contingencies and long closes are all possibilities. If you are a Seller, homes are still moving if we price them properly it should move in 17 to 30 days. The hardest part is to understand the market and not going after peak pricing that passed us in April. That market has passed us at this point. To be clear the market is still a healthy and more balanced. Silicon Valley Homeowners have been spoiled by homes selling in a week with multiple offers which was never scalable. 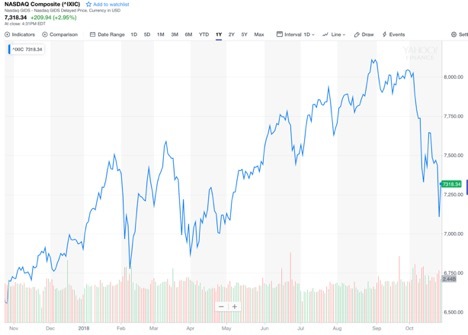 With the latest concerns especially around the equity markets and rising interest rates coupled with the slower typical seasons, Real Estate in 2019 should continue to stabilize and could possibly also mirror the volatility of the equity markets. Though we cannot predict the future, it is likely that 2019 will be another more stable and balanced market for real estate. We wish you the best as you close out 2018! Reach out to us at alan@alanwangrealty.com so that we can analyze your specific real estate situations! We are excited to share our Q2 2018 Silicon Valley Real Estate update. We will start off by saying that the market has at long last SHIFTED to the Buyers’ favor! It has been a roller coaster this year and we have many areas to update you on! The beginning of the year continued the previously hot Sellers’ market of 2017. The same story continued this year; low inventory levels, large quantity of Buyers, intense bidding wars, prices rising on a weekly basis and each home selling aggressively more than the previous week’s sale price. If a Buyer had less than 30% percent downpayment and did not make it into the top 3 offers, they would have had little to no chance to win. Agents and Buyers had to be aggressive, constantly following up, overbid pricing by emotion, waive all conditions on their offers, close quickly and give in to the terms of the Sellers. The Sellers during this period truly maximized their gains both on pricing and terms. In April we started to see some softening in the market as we started to notice fewer offers per listing. We monitored this trend to see if this was signaling a possible stabilization in prices. Literally the first week of May we saw Buyers stop in their tracks. The typical indicators remained strong; Open House traffic, Agent Showing traffic and Disclosure requests all showed normal activity. We were setting offer dates as we have for the last year and a half expecting the same multiple offers, and for the home to sell significantly over list price. That activity came to a screeching halt. Listings got one to two lower priced offers and many had none at all. 11 weeks in now we can confirm that the market has shifted to the Buyers advantage for the first time since 2017. Not all markets have been affected but slowly this is trickling into all price points. What is Causing this Market Stabilization? Understanding this market stabilization requires analyzing the historical and current trends both at a Macroeconomic and Microeconomic level. It is important to note that this type of aggressive Sellers’ market was never sustainable. Even as Realtors in the business, we would watch our listings blow through the last comparable home sales and we have always known that at some point there must be a stabilization. It is also important to note that it is abnormal for a market not tohave cycles for such a long period of time. We typically have seasonality in our local real estate market. The same stabilization happened in June of 2016 as well and in years past, so none of this is out of the ordinary whatsoever. The key question is what changed at the macroeconomic level that would cause a direct correlation to this market stabilization? The first key indicator for the Silicon Valley is the health of the Stock Market, especially the Technology-heavy NASDAQ index. These stocks are the source of the down payments fueling real estate in the valley. International cash offers have been slowed down significantly and heavily scrutinized, hence recent real estate activity is directly correlated to local Technology stock funds. It is interesting to note that on April 2, 2018 there was a low point in the market after the peak set on March 5, 2018. This brief drop even though it lasted a few weeks could have been enough to pause multiple Buyer’s home searches. The second economic indicator is that April is tax month; with a drop in stock prices and likely capital gains to pay, it is possible that Buyers found themselves cash strapped with unexpected tax bills. The third economic indicator would be that the Federal Reserve interest rate rose in April as well. In essence this was a third level of change for Buyers to adjust to, which was more psychological than material, as mortgage rates do not immediately adjust to the Federal Reserve rate changes. However, it is human nature to dislike change and it is likely that the combination of these factors caused the current market stabilization. There are also grumblings of trade wars with other countries that weigh on the minds of many Americans and that impact is yet to be seen. If these changes affect stock values and our economy then that will be the direct impact yet to be seen. It is our opinion that the combination of Macroeconomic factors such as a dip in stock prices, income tax season, and increasing interest rates all played a part in this halt in the real estate marketplace. There are other factors more local to our area specifically that we should bear in mind. It is likely that buyers have become tired of this bidding war environment for the last year and a half and are taking a break. It hasn’t been easy as a Buyer fighting with 10 to 20 Buyers per home, giving up your rights and moving at lightning speeds. Prices were also at all-time highs, and this coupled with rising interest rates may have given Buyers psychological pause. It is also important to note that in the Silicon Valley we have seasonality as well. The summer season is when most homes come on the market equating to more inventory, and Buyers have more choices. It is natural in those cases that homes will sit longer on the market. 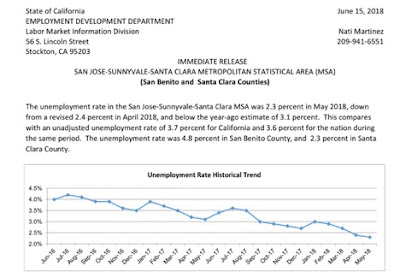 Employment rates in the Silicon Valley are at all-time highs and the health of the Silicon Valley employment market continues to be strong. From last year, employment has risen by 3.1% and the unemployment rate down to 2.3%. These are all healthy statistics for our local market. Local Technology Giants continue to expand all across the Bay Area. From Facebook picking up real estate in Sunnyvale and Fremont, to Google’s build out in Downtown San Jose, this supports the fact that hiring is strong as companies continue to fight for commercial real estate across the valley. There is no need to panic because rates are slightly on the rise. Interest rates are still at historic lows! Ask Buyers who bought in the 80’s how high their rates were. Certain banks have been offering deposit incentives for a lower interest rate; these types of programs exist as well. 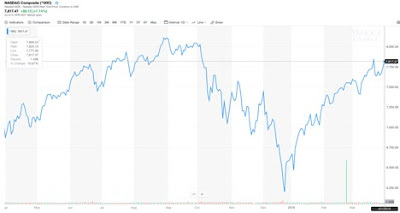 If you are a Buyer you can at last celebrate that the market has finally turned in your favor and it will likely continue to be the case for the rest of the year. The key question is will you follow the herd and wait, or will you take advantage and go for a home when less Buyers are doing so? It is very possible that the herd will be back once again in the spring. Do you want to follow the herd as they were bidding this year? Buyers tend to have the most choices in the summer, though they will find better deals in the fall, but not as much selection on houses during the latter seasons. If you have been thinking of buying, we highly recommend that you re-engage while the market is on your side. 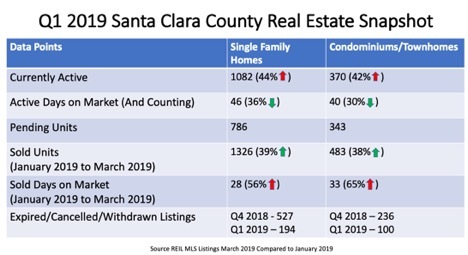 If you are a Seller this will be the toughest market for you, as likely you have been used to seeing homes selling in a week and over the last sold price consistently, and that activity has now halted and turned the other direction. Currently prices are going the opposite direction from the last peak prices 11 weeks ago. We are seeing 10% to 15% drops from last peak prices in some locations. This change is especially hard to accept. The first off market or first week offer could be your best offer. Waiting longer gives the Buyers even more advantage as the freshness of your listing goes stale and they begin to low ball you the longer your home sits on the market. Expect longer days on market, as much as 30 to 45 days. Houses are still selling just taking more time. Again, selling a home in a week was never sustainable. Buyers are taking their time, looking for deals and they have other options on the market. If you have owned your home for some time, celebrate your gains. You may have missed the peak of this year but coming off peak isn’t the worst scenario in the grand scheme of things. If you are looking to maximize, you may need to wait for a different season that is more to your advantage, assuming the market isn’t turning into a longer-term bear market. If you believe the market is turning for the long run, then it would make sense to take your games and exit the market. It is important to note that we do not have a crystal ball. Given the typical seasonality of our local market, it is likely that this market will remain slower now and for the rest of this year with an advantage to the Buyer. 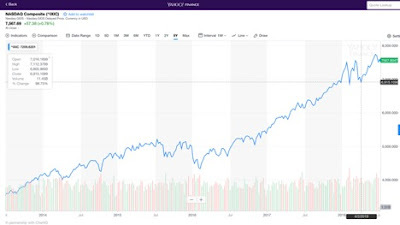 Looking forward, it is true that we are in year 10 of this bull market. There is always a possibility that a major shift is occurring and the market turns into a bear market now and for the foreseeable future. However, given the fact that the economic indicators appear to be more short-term blips than anything longer term, there is a big possibility that 2019 will be the return of the fierce Sellers’ market once again. We wish you the best for the rest of 2018! 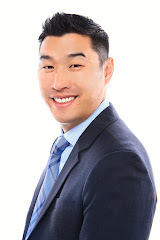 Reach out to us at alan@alanwangrealty.com so that we can analyze your specific real estate situations!